At the risk of further irritating the ignorant but proud online critics who waxed warm against my ‘Misreading the Bible’ column in the Jamaica Observer of December 18, 2016, I share additional pointers which first appeared in the Barbados Advocate on April 1, 2009. 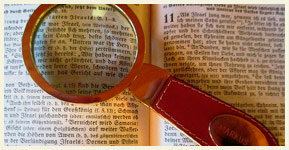 Though many (learned and unlearned folk) seem not be aware of it there is an academic version of the biblical “believe not every spirit…” It is “double-check all sources.” I ‘push up’ myself in the company of reputed scholars and join Egyptologist William Dever in asking “How is it that the biblical texts are always approached with postmodernism’s typical ‘hermeneutics of suspicion’, but the non-biblical texts are taken at face value? It seems to be that the Bible is automatically held guilty unless proven innocent.” This quotation is on p. 128 of Dever’s 2002 (paperback) book What Did the Biblical Writers Know and When Did they Know It? It should be noted that Dever’s book is quite critical of the biblical documents at points. Were I a gambling man I would bet thousands of dollars that the average proud Afrocentrist simply parrots back what another respected Afrocentrist says without taking the time or trouble to personally check the sources used by that other Afrocentrist. Christians are similarly guilty. Hence, mistakes in argumentation and facts are compounded and reveal stark ignorance about the literary conventions at work in the ancient documents. For example, when the average Bible critic charges that if the Biblical Exodus really happened it should have been mentioned on some Egyptian stele somewhere. Such a critic needs to know that Pharaohs never document defeat; indeed they sometimes exaggerate their victories. But then again, hyperbole was the norm in Near Eastern military reporting and this is evidenced in the biblical book of Joshua as well as on Merneptah’s stele. Despite these limitations in Manetho’s work “…historians today take Manetho seriously and follow his dynastic system.” (James K. Hoffmeier, Ancient Israel In Sinai, 2005, 18). A final example is the modern critic’s aversion to biblical accounts containing divine intervention. Again the Merneptah stele, like the Bible, provides evidence of divine intervention in a historical narrative. British Egyptologist and linguist Kenneth Kitchen says, “The support of deity is repeatedly invoked in what are otherwise straightforward historical accounts, because that is simply how the ancients saw their world. Again, the Ten-Year Annals of Mursil II are a good example among very many. This feature does not imply nonhistoricity either outside the Hebrew Bible or inside it.” (On the Reliability of the Old Testament, 2003, 175). Critics as well as lovers of the Bible who desire to be taken seriously must do their homework on reading ancient texts in their literary context.